The best way to eventually become your own boss is to start a side hustle and build your self-employed income, while you still have the safety and security of your day job. What's more is that starting a side hustle not only pads your income, but it also creates career-changing opportunities you wouldn't have normally stumbled upon at your full-time job. Many side hustles have led to new jobs, surprisingly useful relationships, and lifelong friends. It's also helped build the business I have today as a content marketing consultant. However, building a side hustle to profitability with a limited amount of time outside of your day job is never easy. It takes ruthless prioritization, a psychological shift in how you view what's most important in your life and the willingness to get very creative and scrappy on a daily basis. If you want to be an entrepreneur, there are many reasons you should start small with building your side hustle customer-by-customer from the ground up. For one, the prospect of making more money on top of your regular pay is a powerful incentive, especially in a volatile economy. A long-time hobby can also motivate you to grow a business around things you love. Aspiring entrepreneurs with a strong drive can look to a side hustle as a stepping stone toward financial freedom. Your side hustle can also allow you to focus on what you're most passionate about if you don't get that satisfaction from your full-time work. It can give you the flexibility (and extra savings) to travel the world, care for the environment, or pursue causes in a more meaningful way. A large number of Americans (myself included) have launched side hustles related to freelancing, consulting and other online-based businesses while having regular employment. In fact, according to a 2016 study by LinkedIn ProFinder, more than 331,941 professionals in the U.S. alone are already freelancing on the side of their day jobs. While most people will tell you they have hopes and dreams of becoming an entrepreneur, the flip side of this picture is not as thrilling. To put it bluntly, the vast majority (nine out of ten) of new businesses are doomed to fail. Believe me, I’ve been there. My first business managed to join the failing 90 percent in a fiery inferno. I learned the hard lessons, turned things around drastically and formulated a 10-step framework to help you avoid my biggest mistakes. Part of becoming successful with an entrepreneur means starting small and growing with your customers – that's where the side hustle comes into play. If you’re planning to start a side hustle, here are 10 steps that'll help you get more traction, while you keep your day job and only source of dependable income. Businessman and philanthropist Tony Robbins recently shared with me that he believes, “business success is 80 percent psychology and 20 percent mechanics.” What he means is that even a great product or service won’t take you very far if you lack the grit, determination and genuine interest in helping your future customers solve meaningful problems. So before you start a side hustle (or any business for that matter), you need to ask yourself how badly you want to succeed. If you’re just toying with a business idea and entertaining the notion of striking it rich, don’t expect success to happen overnight or that you’ll make it past the finish line. Remember, your side hustle will begin taking many hours each week away from precious moments you'd otherwise be spending with friends, family and elsewhere. A side hustle also requires herculean effort to succeed, given that the majority of your time each day goes to your full-time job. Make a serious self-assessment about whether or not this is something you're willing to make sacrifices in order to achieve. If you are willing to sacrifice, develop a system of positive triggers and routines to help support your self-discipline and exert all your extra effort to grow your side hustle, then you have the psychological foundation to build a successful business. For example, many musicians monetize their skills by offering online guitar, violin or piano lessons. 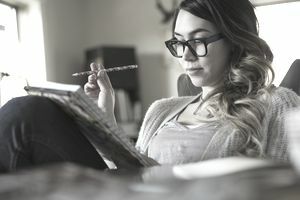 On the other hand, some creatives also have profitable freelance side hustles as graphic artists or digital storytellers. If you lack key skills that relate to your interests or the side hustle you want to create, there's no better time than the present to learn them. Your side hustle idea may seem incredibly awesome and disruptive to you, but that’s not necessarily how your potential customers will see it. More likely than not, they’ll ignore it like the vast majority of “brilliant ideas” that have been productized and unleashed given the sheer amount of daily distractions and advertisements we're exposed to. The real reason you need to validate your side hustle idea with a paying customer before getting too far into the business is to make sure you're not creating a solution to a problem that doesn't really exist. The “lack of market need” has been cited in an extensive CB Insights study as the top cause of startup failures. So be warned, there’s a good chance you’re nurturing an idea that not enough people will find value in. And if nobody wants your product or service, the resources (time, energy, effort) you invest in building it will just go down the drain. To prevent this from happening, be sure to validate whether your product or service will gain traction in the real world. You can do that with objective feedback from potential customers and asking them to join a waiting list, pre-purchase your solution or hire you as a service provider. Quickly abandon ideas that aren't getting a positive response and consider more feasible opportunities. Unless you’ve built a totally new product or service that’s a class in and of itself, chances are you’ll be positioning your side hustle against other established players catering to the same target audience. Competition is an inevitable part of doing business. In just about any niche, competitors will try to outperform your product or service, nab as many of your customers as they can and look for opportunities to innovate past you. To prevent this from happening, all you need to do is secure your value propositions with a serious competitive advantage. Your competitive edge can be anything that differentiates your business from that of your competitors. This can range from smart (or low) pricing, aggressive sales tactics, higher profit margins, unmatched customer service, best-in-class features, strategic relationships, intellectual property and other specific factors that clearly differentiate your brand from the competition. Your competitive advantage is what makes customers choose you, and continue coming back for more. It’s commendable to dream big. But when it comes to actually making your side hustle a success, you will get absolutely nowhere by aiming for the end zone straight out the games. In order to make your larger goals happen, you need to start with very small, incremental goals. After bringing on one satisfied customer, it's time to get your second. Then your third, fourth, fifth and so on. If you begin by aiming for 1,000 customers instead of just one, you'll get too overwhelmed with everything that needs to be in place before handling that many customers. In my experience, having practical goals that are attainable on a daily, weekly and monthly basis helps you develop positive habits and train yourself for success. One good framework to use when formulating goals is the SMART Goals Criteria. Developed by management icon Peter Drucker, SMART is the acronym for Specific, Measurable, Achievable, Relevant, and Time-bound. A good, viable side hustle idea should be launched, monetized and iterated. Don't obsess over trying to build the perfect solution when you don't yet know what exactly your customers will resonate with most. Otherwise, you’ll just waste precious time, trapped in a perennial dream state. To help you beat the inertia, draw up a simple action plan that lays out key milestones and deadlines that'll guide you from start all the way to launch date. Stick to your deadlines, tell friends and family about them, hold yourself accountable and don't allow yourself to make excuses. Then perform the actions needed to move from one milestone to the next. Again, never aim for perfection because it will bog you down and prevent you from ever launching anything. By now, you know your strengths. You can’t be good at everything all the time and you shouldn't want to be. The reality of starting a side hustle is that you're going to have weaknesses. That means some (or even many) of the skills necessary to efficiently running your side hustle must be found elsewhere in order to free up your time to continue doing only what you're best at within your business. For example, you might be good at accounting and management, but your graphic design skills will easily turn off your audience instead of getting them glued to your message. To fix this, do the things you are good at and work to outsource everything else. I recommend not even trying to learn new skills in the immediate term, unless they strongly relate to both your what you're interested in and the needs of your business. Outsourcing your weaknesses is a more effective and easily implemented alternative. It's also more affordable in the long run as the value of your time increases significantly. Without feedback from your earliest customers, you'll expose your side hustle to the serious risk of failure. You may be planning to build a product that doesn't do the best possible job of solving your customer's problems. Without objective, external feedback, you’ll likely execute the plan, invest considerable time, money and effort in the process, only to lose all those valuable resources in the end. Make a habit of internalizing sometimes harsh feedback and you'll force yourself to continually improve your solution as you progress. Obviously, you shouldn’t work on your side hustle during company time, nor should you use company resources to advance your own pursuits. Not only is it unethical, but it's likely a violation of the employment agreements you signed when you began your job. Make it a point to honor every term in your contracts and to consistently deliver excellent performance at your day job even while having your side hustle picks up momentum. Compromising your quality of work and reputation in the office will prevent you from re-engaging and even potentially partnering with your old employers once you go full-time as a business owner yourself. More importantly, non-compliance to contract terms can lead to disciplinary and even legal action, I've learned this lesson the hard way. My advice is to never leave your day job until your side hustle is providing you with a sustainable, growing cash flow that exceeds that reaches to at least 75 percent of what your day job pays you. Most entrepreneurs have a healthy appetite for risk, but you shouldn't plunge into anything without having a decent chance of success. Moreover, have at least six months worth of savings for both personal and business purposes to pad yourself in the likely event that your business doesn't grow as quickly as expected. Remember that having excited customers and translating them into revenue in the early stages of your side hustle is your clearest indicator of future success. If you have a family to support, restrain the urge to immediately quit even more so. So far, the data still shows that most new businesses have a pretty low chance of achieving success. However, that shouldn't deter you from pursuing more meaningful self-employed work. The best time to build a business is when you have a full-time job that covers all of your living expenses. Think of your regular employment as hedging against the risks you're taking as you test the viability of your side hustle.